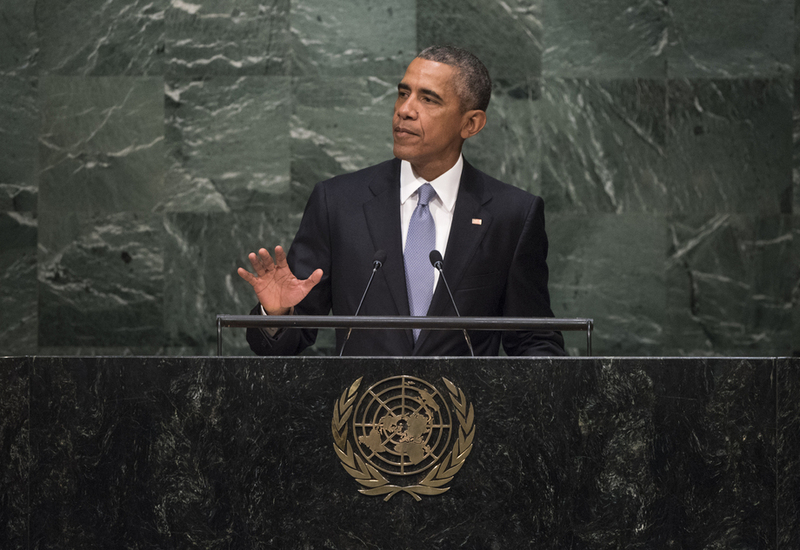 BARACK OBAMA, President of the United States, reflecting on the achievements of the United Nations during its 70 years, warned, however, of dangerous currents that endangered the system of collective security. Some, he said, argued that the ideals enshrined in the Charter were out of date and that power was a zero-sum game. According to that logic, tyrants such as Bashar al-Assad should be supported because the alternative was worse. The nations of the world, however, must not return to the old way of conflict and coercion. “I lead the strongest military the world has ever known and I will not hesitate to protect my country or its allies,” he said. At the same time, he acknowledged that the United States could not solve the world’s problems alone. In Iraq, his country had learned the hard lesson that hundreds of thousands of troops and trillions of dollars could not impose stability on a foreign land without a coalition under international norms. Likewise, dictatorships were unstable; the strong men of today sparked revolution tomorrow. It was possible to jail opponents, but not to imprison ideas. Real strength rested on the success of a nation’s people — their knowledge, innovation, imagination, creativity and opportunity — which required good governance and individual rights. A principal achievement of the United Nations, the Nuclear Non-proliferation Treaty, had been endangered by Iran’s violations. The goal of the resulting Security Council sanctions was not to punish, but to try to get Iran to change course. For two years, the United States and partners had stuck together through complex negotiations to achieve a lasting, comprehensive deal that allowed Iran to have access to nuclear energy for peaceful purposes, but not weapons. That was the strength of the international system when it worked the way it should. Nowhere was the commitment to international order tested more than in Syria, he said. When a dictator slaughtered his people and when a terrorist group beheaded captives and enslaved women, then that was not only a nation’s internal affair. There was no room for accommodating “an apocalyptic cult like ISIL (Islamic State in Iraq and the Levant/Sham)”. While the United States would work with any country, including Russia and Iran, there could be no return to the pre-war status quo. Maintaining that the crisis had begun with repression of peaceful protests, he called for a managed transition away from Assad towards a new inclusive Government. Among other points, he noted that the United States was welcoming an increasing number of refugees and he pledged to work with every nation to confront climate change and to end extreme poverty. Stressing that the strongest leaders, from George Washington to Nelson Mandela eschewed personal power, he admitted that democracy was frustrating. It was certainly imperfect in the United States and, at times, dysfunctional. But, inclusive democracy made a country stronger. When opposition parties could seek power through the ballot and a free media could expose corruption, when immigrants were welcomed, when girls could go to school, that was when a country realized its full potential.